It has not been a fun year for Facebook. The social media giant has scored a hat trick in misleading advertisers. In a recent blog post admitting the claims, the social media giant explained that it had identified discrepancies between count for the Like and Share buttons via its Graph API. It also identified discrepancies in the Like and Share counts when a user enters a URL into the search bar in the Facebook mobile app. Inconsistencies were also discovered from its streaming reactions feature for Live videos. This was due to the misallocation of extra reactions from “Reactions on Post” to “Reactions from Shares of Post” section in the Page Insights function. “Note that total counts were and are correct; some of them were just captured in the wrong reporting column when broken out,” the blog post explained. It has since promised a fix for the issue to newly created Live videos effective mid-December. Just in November, Facebook admitted in a blog post that it discovered miscalculations on the number of completed video views, the total organic reach for business pages and the amount of time spent with Instant Articles. The company reportedly overestimated the number of people that brands had reached with unpaid posts on their Facebook pages during the preceding week and month. This was because it neglected to prevent duplicate repeat visitors –double counting. In September, the social media giant apologised for an error in the way it calculated video viewership, overstating the time users spent on average watching videos on its platform. This gave marketers a wrong view on how well their ad had performed. 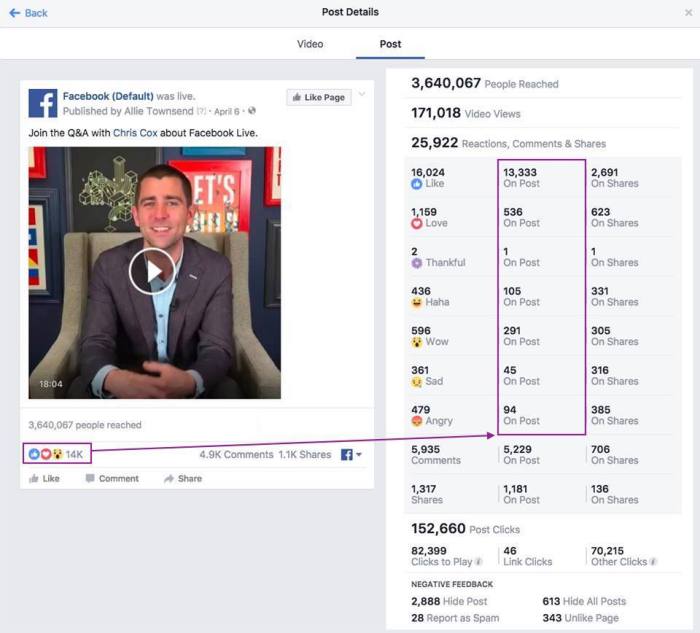 According to Clarence Chew, head of marketing at Decathlon, this revelation will impact marketers who rely on Facebook’s metrics heavily to measure the success of campaigns, but for businesses which do not focus on these functions – the impact is less. In the case of Decathlon, Chew added that there is less focus on the likes but more on potential sales leads which a social media campaign brings. “For example, rather than focusing on the amount of likes, shares or reactions garnered, we would be more concerned on how much traffic the social media post drives to the main site,” Chew explained. Agreeing with Chew is Prantik Mazumdar, managing partner at Happy Marketer, who views most of the metrics that Facebook reports as “vanity metrics”. “Whilst important, they are not the most important parameters that a marketer must monitor. I would be more concerned about traffic, leads and sales conversion data,” Mazumdar said. While Mazumdar feels this is not as serious as other issues such as the recent admission of inflated video view counts, the hiccup might lead marketers to take the new Reactions metrics less seriously. However, he adds, this being the third such misreporting issue in three months from the media giant, is not acceptable as this creates a lot of confusion amongst agencies and clients and creates scepticism about Facebook’s Insight platform. Mazumdar advises marketers that relying on Facebook’s native Insights platforms alone for measurement would not enough, instead, marketers should look towards third party tools. This is to ensure use of objective data to validate Facebook’s numbers and relative benchmarking of the metrics. “Not only would this provide context to the numbers being report but will negate the impact of the erroneous reporting as this misreporting impacts all pages,” Mazumdar said. One marketer which spoke to Marketing under anonymity said that the revelation would definitely impact trust – primarily when it comes to videos and branded content. “When it comes to direct response formats such as Newsfeed and lead ads, brands do have a means of verification such as web analytics platforms. However, for branded content such as video as well as engagement metrics, we rely entirely on Facebook’s analytic platforms. This is a major source of concern,” he explained. He added that his brand is currently working with Facebook to see how it can set up test cases to verify data so that such reports can be used to authenticate the performance of the campaign as well as the platform vis-a-vis other platforms. “In the short run, there is bound to be some impact while we re-evaluate efficacy of the branding efforts on Facebook. However, given the scale and reach of Facebook in Singapore esp in the post 30’s age group, which is critical to our business, we find it difficult to ignore the platform at this point of time,” the marketer said. Fiede Schillmoeller, Sonos head of global expansion talks to Marketing Interactive about the brand’s plan of expansion in Hong Kon..
Ng joined the digital marketing solutions company in 2016 and has experience in strategy including digital marketing, creative str..